The tradition of Day of the Dead might seem a bit macabre, but it’s actually a annual joyful celebration of the after-life in many Latin countries. The celebration includes the decorating of family burial sites and in the home, the use of artwork and décor centered around food, skulls and vibrantly costumed miniature skeletons placed upon small homemade altars. Known for its ornate costumes, artwork and décor, all centered around the image of a skull. 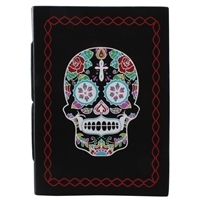 Our skull and Day of the Dead items span a wide range of styles and imagery. 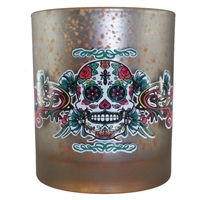 Items like sugar skull banks, key chains, candles and mobiles. The style of Day of the Dead is one of the most recognizable cultural aesthetics and is used in a wide range of retail décor. Shop everything from glass trays, boxes and journals, novelty items and more with World Buyers today! Glass tray surrounded with skull and roses. Slightly concave tray.1 Dozen Clearance price shown Now 60% off! Assortment of sugar skull magnet in traditional festive colors. Order increment is 4 box minimum. Three different floral sugar skull designs! Assorted dozen. Hundreds of glass tiles in rich colors compose this unique mosaic skull.Has wall hanger on back. Product Dimensions: 8.25" H x 7.5" W x 0.44" L Clearance price shown now 50% off! Assorted dozen in pink, white and blue. Modern skull style rectangle glass box. A great for him gift! Sugar skulls in 3 designs on bone china mug. Each mug in decorative gift box with view hole in front. 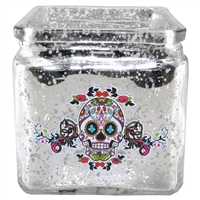 Lovely glass box featuring artwork of an adorable bride and groom with a Day of the Dead twist. Glass tray with a lovely skull on display! Clearance price shown nearly 50% off! Assorted dozen mini journals with vintage potions and spells artwork.